Everybody loves a good book. Especially when the Texas Book Festival, the celebration of literature, takes over downtown Austin each year. Each year is more exciting than the last, so we can’t wait to see what’s in store for this year’s festival. “This year is going to be huge. And it should be, it’s our 20th anniversary,” says literary director Steph Opitz. . In honor of the festival’s milestone, the Texas Book Festival just announced 20 authors who will be featured this year’s Festival weekend, October 17 and 18. The authors include Margaret Atwood, Chuck Palahniuk, Wendell Pierce, Sandra Cisneros, Adrian Tomine, and more. Visit the Texas Book Festival website to see the whole list. In addition to a litany of literary delights, the Texas Book Festival presents visual arts as well. 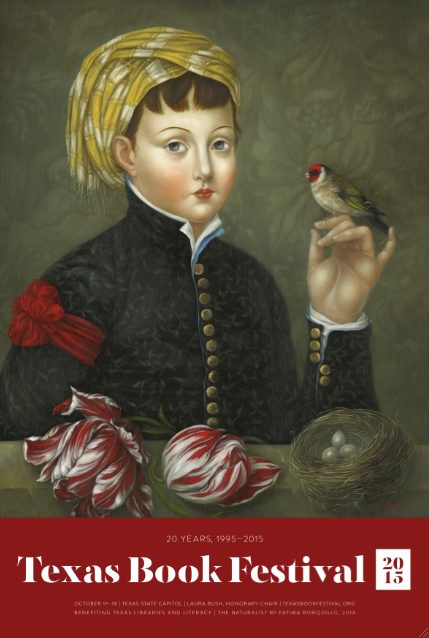 Check out the special poster for this year’s festival, featuring a beautiful painting by Fatima Ronquillo. The Festival is held on the grounds of the Texas Capitol each fall and features more than 250-plus renowned authors, panels, book signings, live music, cooking demonstrations, and children’s activities. Visit www.texasbookfestival.org for more information, and join the conversation using the #txbookfest on Facebook; and @txbookfest on Twitter and Instagram.